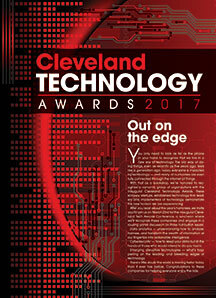 Kent Displays is honored to be recognized as one of the region’s leaders in technology with the 2017 Cleveland Technology Award. The company received its honors in the Established Tech Firms category at the awards event held in Cleveland on March 23, 2017. “After many years of offering R&D solutions to other brands and manufacturers, Kent Displays now develops technologies that are incorporated into finished products and sold to consumers through a variety of channels. CEO Albert M. Green, Ph.D., drives the organization to stretch science and engineering boundaries, to create unique industrial designs, to market internationally across diverse media and to deliver customer value. With highly automated proprietary manufacturing technology, KDI can manufacture the key component of its product, the writing surface, in the U.S. This benefits both the local and national economy, and permits easier IP protection. Attending the awards event on behalf of Kent Displays were Dr. Erica Montbach, Dr. Mauricio Echeverri, Anthony Daniels, Nithya Venkataraman, and James Alay.